The South Coast region includes several fishing communities in Los Angeles, Orange and San Diego counties. Historically, this area was known as the “tuna capital of the world," hosting a large fleet of tuna seiners and tuna-processing canneries, along with a variety of other fisheries. By the early 1980s, most of the canneries had moved offshore (to US territories and other countries). This significant change was due in large part to lower processing costs and the shift of many fishing operations to the western Pacific to avoid conflicts with dolphins and porpoises. Nonetheless, the region’s fishing communities have remained vital due to the continued productivity of the ocean ecosystem, the proximity to large urban centers and extensive port infrastructure, which connect them to domestic and global markets. Although the commercial tuna fishery here is much less active than in the past, this region has continued to support a variety of fisheries, with coastal pelagic species (market squid and sardine in particular), spiny lobster and red sea urchin among the most active today. However, the mix of fisheries and level of activity in each port and overall varies as a function of changes in species distribution and availability, market demand, regulations, physical infrastructure, buyers and other factors. See our regional seafood posters and the California commercial landings data (links below) to learn more about the fisheries of this region. 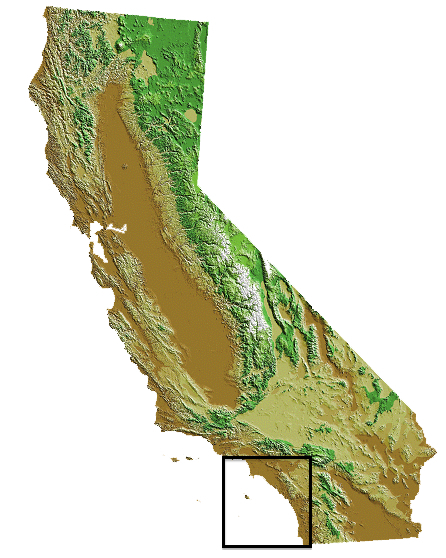 The four Southern Channel Islands – Santa Barbara, Santa Catalina, San Nicolas and San Clemente – are located about 20-78 miles (32-126 km) offshore from Los Angeles to San Diego. These islands provide habitat for many species, as do the region's coastal bays, enhancing the fisheries of the area. While coastal geography and wind patterns limit upwelling in the region, several submarine canyons provide nutrient-rich waters to the coast, supporting a diversity of ocean species. The region’s close proximity to sub-tropical waters also adds to its fisheries diversity and productivity, as highly migratory species such as yellowtail and yellowfin tuna often migrate with the warmer water into offshore areas of the region. Temperate species such as albacore and bluefin tuna and swordfish also use these waters during their seasonal migrations. California Marine Life Protection Act Initiative (CA MLPAI). 2009. CA MLPAI Regional Profile of the South Coast Study Region (Point Conception to the California-Mexico Border), June 25, 193 pp. Hackett, S. 2002. An Economic Overview of the California Wetfish Industry Complex. In California's "Wetfish" Industry: It's Importance Past, Present and Future, edited by D. Pleschner-Steele, Santa Barbara, CA: California Seafood Council, 65 pp. Pomeroy, C., M. Hunter and M. Los Huertos. 2002. Socio-Economic Profile of the California Wetfish Industry. In California's "Wetfish" Industry: It's Importance Past, Present and Future, edited by D. Pleschner-Steele, Santa Barbara, CA: California Seafood Council, 42 pp. San Diego History Center. 2012. TUNA! Celebrating San Diego's Famous Fishing Industry. Museum exhibit, April 21-December 31.